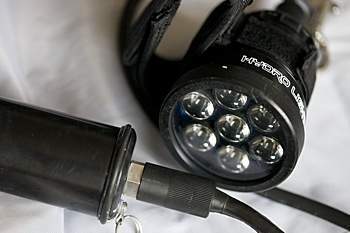 A few years ago, I purchased a 10W HID canister dive light from a well know manufacturer. 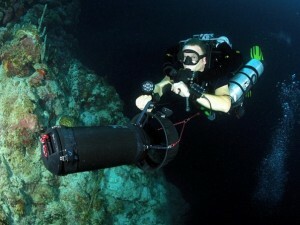 After a few dives on our northeast wrecks, I realized this was the wrong choice for me. The 10W HID I had bought was not very powerful of course but most importantly I didn’t think it would endure the rigors of diving around Boston but more importantly the way I treat equipment. There was too much potential harm that could come to such a light. Having to open the canister to remove and charge the battery, potentially damaging the (user replaceable) o-rings and compromising the water tightness of the canister, thus risking a flood, wasn’t desirable. HID bulbs are notoriously fragile and I had heard horror stories. Moreover, used to quality chargers in electronics such as laptops, I was appalled by the build and functionality of dive light chargers, some didn’t even have charge indicators. They looked like a $10 Radio Shack power brick hacked into a battery charger with a pair of scissors, some masking tape and cheap components. Determined as I was to find a tougher, brighter and better light, I set my eyes on the Titan Dive Gear HydroLights X-Series. Titan Dive Gear’s other line of dive lights, the SCULA, has a battery built into the light head but can also tether to a battery canister. I bought the 25W X-series which uses 7 LEDs for its max illumination and 3 to reach a dimmer 10W like illumination. The 25W X-series retails for $1065.00 with the smaller of the batteries (lasts plenty though). LED lights are very tough as there are no bulbs to break and I feel fine throwing my lights in my dive bag with all my other gear. 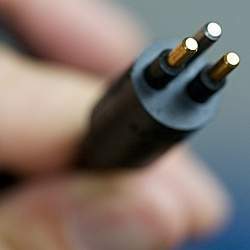 The X-series is built tough from the head to the cable (and connector) to the battery. In fact, each light is tested to 600ft for three hours in a water pressure pot before they leave the factory. Let’s talk a bit about the connector and LiCo (Lithium Cobalt) battery canister. To charge the battery, you simply connect the charger directly to the canister. To use the light, you’ll connect the light cable to the battery on one side and to the light head. on the other. The battery canister doesn’t open and you don’t need it to. As you can see, it’s very foolproof. Also, when the batteries are fully charged, the LED on the charger will turn green. This might seem obvious but not all dive light chargers do that. Also, I find the Titan batteries to be exceptionally light and small for their capacity. In fact they’re so small that I prefer to stick the canister somewhere on my rebreather than on my harness belt. The magnetic switch on the light head (instead of somewhere on the cannister) makes that pretty easy. I have been using my light for about a year now and it’s still going strong. I keep a couple of batteries around, one that lasts nearly 5 hours at 25W and 12 hours at 10 W. The other one smaller (they’re both small compared even to a 10W HID canister, not to mention the big 21W or 35W canisters) will last 8 hours at 10W and a little over 3 hours at 25W. the 25W X-series head is a little on the bulky side, it doesn’t always balance well on your hand. Spare parts for the X-series are available but a replacement 120W is $525, a spare cable is $120. On top of the $1200 25W X-series, grabbing a spare battery and cable brings the total cost to a whopping $1845. Because you have to pay for the canister on top of the battery element, spare batteries are more expensive than on a classic canister light. I have the 10W SCULA from Titan. I’d been using my trusty 10W Salvo HID for a over a year with never any trouble. I assumed that the 10W rating of the Titan would pale in comparison to the 10W HID, but much to my surprise, it was far better than my HID. Not only that, but while diving with others who have up to 20W HID’s, my little hand-held 10W SCULA was just as bright, and just as usable for signaling. I cave dive more than wreck dive, and in the cave environment, the SCULA is hard to beat. After diving mine for a couple of weeks, I’ve had numerous comments from many different people, all inquiring on cost on where to purchase these lights. I also HIGHLY recommend the Titan SCULA’s – They are strong, rugged, last a long time, and are a great, all-around light. I have the 25W light as well & have had it for about a year. I have an extra battery and cable that I got free from the company due to some early problems I had with the light ( got a dud charger that shorted my light out). Their customer service has been outstanding and they have been unbeatable in their service to me. They offered me a another light when I had sent in my light for service just so my dive trip would not be ruined. I have never had such good service before from any dive company. I love my light and must say it is way brighter than my buddies 10w HID, when my light is set to 10w. I have two hydrolight the scula kit10 and the other, the scula kit 25. I had a problem with the chargers and I must buy one, the 700 smart charge, do you sell this? If not do you know where I could buy one? Sorry but we’re not a reseller, contact them directly? Copyright 2008 Erik Dasque and Sam Clemens :: powered by Wordpress and the The Unstandard theme. :: | | 58 queries. 1.186 seconds.